A replica of Captain Cook’s famous ship the Endeavour will circumnavigate Australia as part of celebrations marking the 250 years since the British explorer’s arrival here. Announcing $6.7 million in funding for the 14-month trip, which includes events at 39 stops along the coast, Prime Minister Scott Morrison said HMB Endeavour’s voyage was “the reason Australia is what it is today” and ought to be commemorated. Cook’s 1770 arrival at the continent now called Australia, which had been inhabited by Indigenous people for at least 65,000 years, will also be marked by the Cooktown 2020 Festival which the government is funding with a $5.45 million grant. “As the 250th anniversary nears we want to help Australians better understand Captain Cook’s historic voyage and its legacy for exploration, science and reconciliation,” Mr Morrison said in a statement. The circumnavigation will be undertaken by the Australian National Maritime Museum‘s Endeavour replica, which was launched in 1993. On his famous 1768-1771 voyage to the Pacific, Cook carried secret orders to seek out a much-hyped “continent or land of great extent” and take possession for King George III, alongside scientific goals. 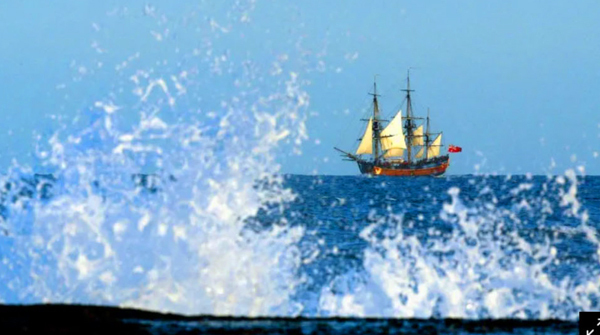 The Endeavour would be the first known European ship to make landfall on the eastern coast of Australia. The breakthrough has raised hopes the ship could be excavated in time for Australia’s 250th anniversary commemorations of Cook’s voyage. The beginnings of modern Australia, Cook’s voyage and the arrival of the First Fleet heralded an era of British colonisation that would result in widespread dispossession, oppression, violence and death for Indigenous people.